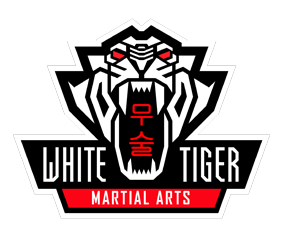 White Tiger Martial Arts was formerly known as White Tiger Taekwon-Do & self-defence. The academy now offers both Taekwon-Do and Korean Kickboxing (Kun Gek-Do) as well as the popular children's Martial Art at "Tiger Cubs". The Academy has been accredited with both the county "Club Standards" and the national "Clubmark" awards for professionalism and strict child welfare policies. We at White Tiger aim is to provide Martial Arts and Self Defence training that encourages personal growth and development for every student with a high standard of tuition geared at his or her own pace. White Tiger prides itself on upholding and maintaining standards of excellence that, inspire students of all ages from 7 upwards to see beyond their current potential and reach new levels of personal success and fitness. By setting goals that are achievable, White Tiger will help the student to gain life skills, build character, improve self-confidence and self-esteem. To champion the student to grow personally, professionally, emotionally and spiritually. I, Mr Paul Wanklyn, White Tiger’s founder and Chief Instructor, along with my dedicated assistants, aim to help the student realise the potential that lays within us all by using my compassion, unique perspective, and my belief in others inherent goodness and integrity. White Tiger will instil traditional values of respect, discipline, honour, loyalty, family values, and courage, building leadership skills that will enable the student to become socially accountable - A life champion. White Tiger aims to provide an environment that supports the growth of each student on their Martial Arts journey toward Black Belt and beyond, teaching the code of Courtesy, Integrity, Perseverance, Self Control and Indomitable Spirit. Traditional and authentic Taekwon-do for Men, Women & children from 7yrs and above. Specifically designed for children between the ages of 4 & 7 years of age. 12 yrs and above, must be sensible - £10 per person. 12 yrs and above, any grade, must be sensible - £10 per person. Please ensure you arrive in plenty of time. White doboks only please and ensure your licence and grading fee has been handed in the week before. Those students from 2nd kup and above not participating in the grading are welcome to sit at the table. White doboks only, bring your licences to be signed. Open to 2nd Kup and above. £10 per person. Please ensure you arrive in plenty of time. White doboks only please and ensure your licence and grading fee has been handed in. This date may be subject to change and may be held on an alternative date. 12 yrs and above, no jewellery. Come and meet our angry man! This will be the last session of the year so please invite your family along to see the awards being presented. You never know, you may be one of those chosen to receive an award.